With an open Zendesk Support instance you can allow customers to submit tickets without registering for an account or signing in to an existing account. This enables your customers to get help quickly, without taking extra time to register or log in. However, if a customer submits a ticket without signing in, it will be flagged. This is done because the user supplies an email address when they submit the ticket, and it is relatively easy for a user to pretend to be someone else by using an email address they don't own. So there is an inherent risk that comes with allowing ticket submission by users who are not signed, and it can be an opportunity for social engineering. The flag brings attention to the potential risk, without affecting the workflow of your end-users and agents. The flag appears as a warning icon beside the first comment in the ticket. The ticket is not flagged in any ticket views. You can hover over the warning flag to get more information. If you are comfortable with the comment, ignore the warning flag and handle the ticket as you normally would. You cannot remove the flag. If you are not comfortable with the comment, you can raise a concern with your manager or consider temporarily suspending the user. Depending on the nature of the comment, you might want to raise a concern about the ticket with your manager. Also, you can consider temporarily suspending the user, to prevent them from submitting more tickets, until you can investigate and feel comfortable enough to reinstate the user. (See Suspending a user). Note: If you continue to see flagged comments by the same user, and you think that person might be trying to gain unauthorized access, contact our customer service team. When it shows up, the option to 'view original email' is not given, which is inconvenient and confusing. Is there any reason for this? Just to make sure I understand, do you mean that when you go into the ticket events and scroll to the bottom of the list, the "view original email" link isn't showing up? We find that the warning icon is way too small and unnoticeable. In our case we need to take the customer through security when they contact us while not logged in. It's too easy for agents to not to notice this atm. Thanks for that feedback, Maria. 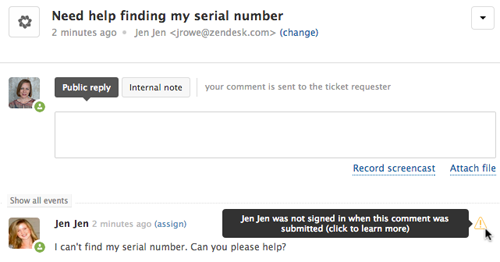 You may want to cross-post it in the Support Product Feedback topic to see if other users have a similar concern. I've had two customers confirmed that they did not receive an email sent from zendesk when we reply to the "flagged" ticket. Has anyone else noticed this issue? This sounds like something we'll need to troubleshoot with you directly and it may require discussing some of your account settings, so I'm going to create a ticket for you to continue this conversation with one of our customer advocates. Look for an email from me shortly!